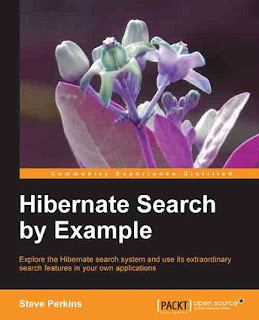 PacktPub kindly offered me a free review edition of Hibernate Search by Example. Though I've used Lucene and Hibernate independently on a lot of projects I've never used Hibernate Search which builds on both technologies. That makes me a good candidate for reviewing an introductory book on it. Hibernate Search is a really interesting technology. It transparently indexes Hibernate entities in Lucene and provides a slick DSL for querying the index. You decide which entities and which fields to index by adding annotations on class and field level. Custom analyzer chains can be defined for the entities and referenced from fields. Each entity is written to its own index but it can also include data from related or embedded entities. By default, Lucene is only used for querying and ranking, the result list is still populated from the database. If this is not enough for your application you can also use projection to use stored fields in Lucene for result display. Steve Perkins, the author of Hibernate Search by Example, did a great job in designing an example that can evolve with the book. It starts very simple, also explaining the build setup using Maven and an embedded Jetty instance with a H2 database. Each following chapter builds on the results of the previous chapter and enhances the project with different features. Each chapter is dedicated to a certain topic that is immediately used in the application so you can see its benefit. This way you are learning different aspects, from mapping entities and performing queries to advanced mapping aspects, analyzing, filtering, using facets and even setting up master slave systems and sharding your data. But not only is the book structured in a good way, the author also has a very clear writing. Combined with the practical examples this makes it very easy to read. If you're planning to implement a solution on top of Hibernate Search you're well advised to read this book. As I am building quite a lot of search applications I'd like to add some impressions of Hibernate Search. Though it's a very interesting technology I think you should be careful when deciding on its use. Not only will you tie yourself to Hibernate as your JPA provider but there are also some implications on the search side. Hibernate Search offers advanced features like faceting, it can be distributed and sharded. But there might be features that you want to build later on that would be far more easy with a search server like Solr or ElasticSearch. Hibernate Search uses some components of Solr but a real integration (using Solr as a backend) is rather difficult I guess. Solr needs in schema configured in a file so you would need to duplicate it. ElasticSearch could be a far better candidate as its schema mapping can be created with its REST API. I am really curious if somebody has been thinking about starting an implementation of Hibernate Search on top of ElasticSearch. With the Lucene implementation that is described in the book you can easily enhance your database driven application with advanced search functionality. But be aware that future requirements might be more difficult to build compared to integrating a search server from the beginning.